Why is there a disconnect between doing content marketing and getting results from content marketing? Although it’s a ubiquitous method, content marketing is not automatically an effective method unless you leverage it in the right way. Follow this checklist of tips, tricks, hacks, techniques, and practices to improve the impact of your content marketing. Content marketing usually “fails” because people quit. Never, ever quit. Many businesses function on the microcosm of the annual quarter. Quarterly earnings, key performance indicators, and metrics must be up and to the right on the graph to validate a current marketing technique. The problem is, content marketing doesn’t work that way. Results – let alone conversions – don’t come instantly. Organizations must develop a long-term vision of their content marketing efforts. Instant results are unrealistic. The mantra, “Content is king,” has been modified by the more nuanced expression, “Quality content is king.” To have great quality content, you have to have high-quality writers. Tip: If you pay $25 an article, you may not find the best writer. The elite writers and content creators usually work at a far higher level of pay. With the rise of quality as a ranking factor, marketers realized that they couldn’t simply push out vast amounts of content. Instead, they needed to selectively push out the best content. Go deep. Articles that treat the issue in depth are far more successful at reaching and convincing an audience. Go long. Long-form content has a higher chance of converting audience. Articles that exceed 1,000 words have a greater chance of appearing in the search engine results pages and prompting user engagement. Use a variety of content. Today’s content needs a strong dose of variety – images, infographics, embedded tweets and Facebook posts, and videos. Be readable. The user’s experience is a crucial factor in the ongoing reliability, authority, and success of the content. Issues such as mobile readability, formatting, style, and layout affect the experience. I rely on a data-driven approach to my content marketing efforts. It’s not enough to publish, publish, and publish. To truly have an impact, my content must make a bottom-line impact on revenue. I use the pyramid approach as explained by Joe Pulizzi. Is the content saving costs? Is the content making our customers happier, thus helping with retention? I’ve seen content marketing work, so I intuitively expect it to move the needle on sales, cost-savings, and customer retention. I insist, however, on seeing actual impact. If you can’t see how your content marketing efforts connect to one of the three objectives, you need to re-strategize. While I like to see myself as an innovator in content marketing, I don’t claim to have a corner on the market of content marketing strategy. The world’s best brands aren’t necessarily the world’s biggest brands. Big brands often have huge budgets that allow them to mass-produce content. Yet, it’s often the small brands that possess the creativity to push the envelope on content marketing strategy. In an attempt to be innovative, some brands have lost their way. In the wake of a major event, marketers often rush to capitalize on the news for their own gain. When such major events – the death of a celebrity, a natural disaster, or maladaptive cultural issue – are tragic, marketing is cheapened and disgusting. Innovation for innovation’s sake is not admirable. What is admirable is listening to what your customers need and want, and serving them. Focus on giving value, and you’ll get value back. There are dozens of places where you could publish content. Just because it’s possible doesn’t mean that you should. If you have the resources and personnel to manage every social account, publish on every blog, comment on every forum, and manage every profile, then go for it. However, if you can’t do a great job because you’re in too many places, stop. Select the one or two channels where your awesome content gets high engagement, and focus on those. There’s a cognitive bias known as the “sunk-cost fallacy” – you believe that you should continue on a path that is obviously not the best because you’ve already invested so much time or resources into it. If something isn’t working, stop it. Reject the sunk-cost fallacy, and do the things that are truly effective. A list is useless. Why? There is no priority. A priority is a thing that is regarded as more important than another. 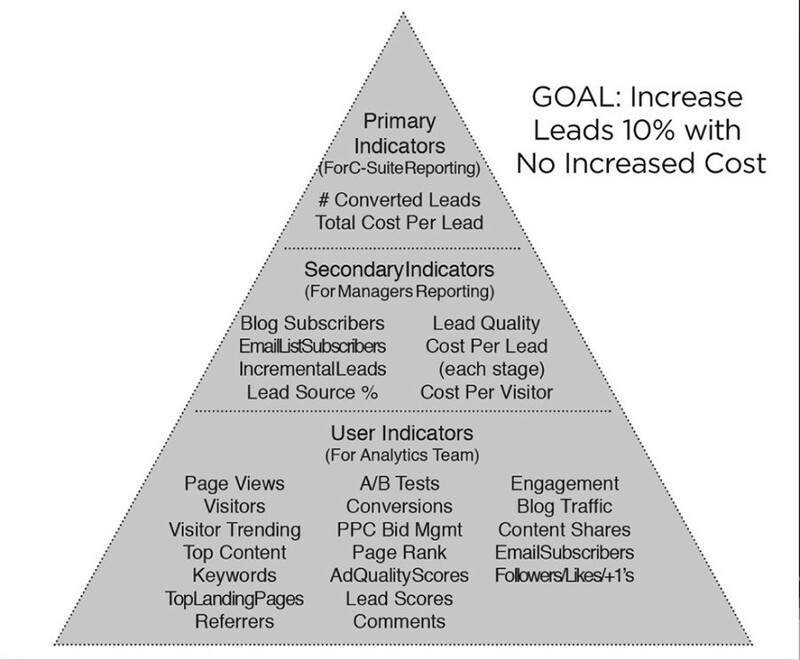 If you had to pick a single goal of your content efforts, what would it be? Focus on that until you achieve it in a measurable way. What about side effects like growing your social media presence? Forget it. Focus on your one thing. For example, let’s say your business objective is to sell more consulting gigs. You know that most of your leads come from your email list. Your goal, then, is to increase sign-ups to your email list. So, instead of frittering your time on a Facebook strategy, Twitter strategy, Google Plus strategy, Reddit strategy, Pinterest strategy, LinkedIn content strategy, guest-posting strategy, and whatever else, nail your one thing: email sign-ups. From now on, everything that you do hones in on that one thing. Sweep everything else off the table. From now on, you’re going to have a laser focus. With email sign-ups as the single focus, what’s the process to achieve your goal? 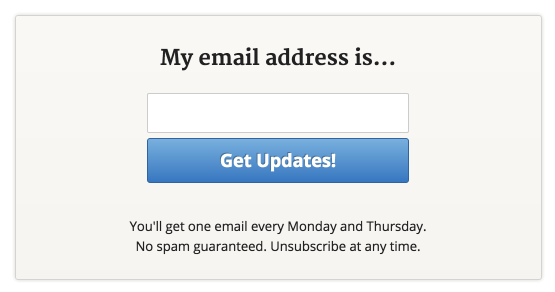 Write killer content for your blog with the call to action for email sign-ups. Entrepreneur, author, and speaker, James Clear, offers a good example of this focus. Nearly every page of his website has the form you see below. On some pages, you’ll see more than one form. James has social media and other channels, but he has a single focus: Get more subscribers. All of his best content is gated. You have to be a subscriber to access it. He reports more than 180,000 subscribers. There are ways to get better at content marketing that don’t cost a lot of money, don’t require a lot of time, and aren’t insanely complicated. We won’t get any better at content marketing by simply doing the same things over and over. We’ll get better by thinking strategically and targeting impact, not repetition. 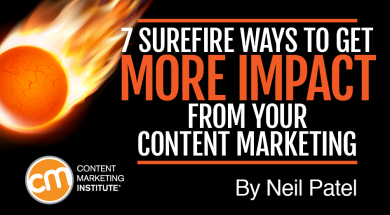 What are some ways that you’ve gained more impact from your content marketing efforts? We’re just a few weeks away from an intensive few days focused on helping you improve your content marketing. There’s still time to register for Content Marketing World in Cleveland, Ohio. Use code CMI100 to save $100.